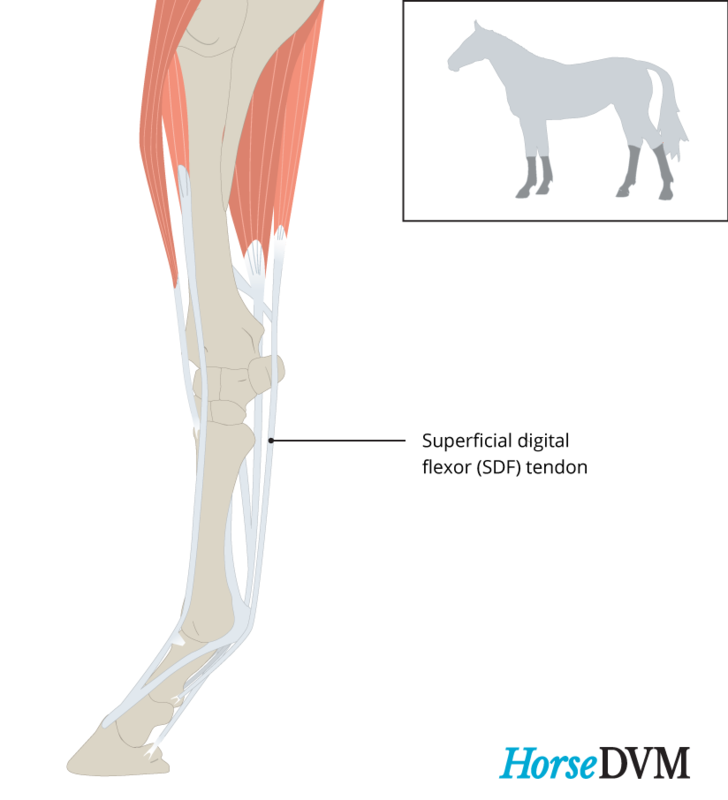 Superficial digital flexor tendon (SDFT) injuries are among the most common type of tendon injuries in performance horses, especially racehorses and top-level event horses. The most common site of SDFT injury is the middle of the tendon, which has the smallest cross-sectional area. The SDFT is found in the horse's fore and hind limbs; running along the back of the cannon bone and connecting the short pastern to the coffin bone. The SDFT's primary functions are stabilization and energy storage. Along with the suspensory ligament, the SDFT has a major role in supporting the fetlock joint. 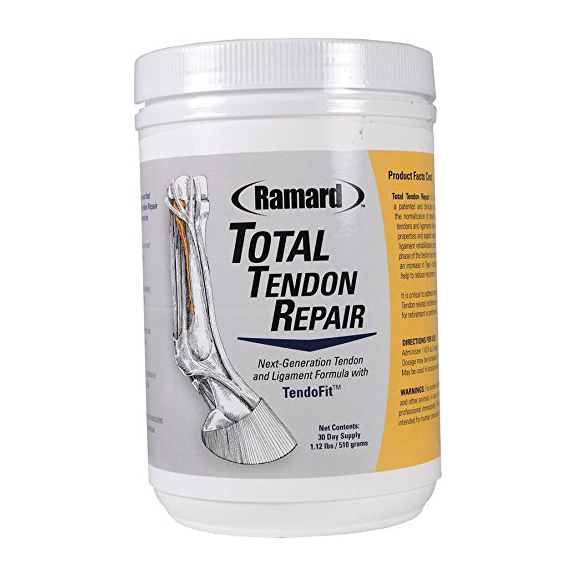 SDFT injuries occur in horses as a result of sudden overloading or progressive weakening of the tendon. However, most tendon injuries are the result of cumulative damage as opposed to a single event, unless its associated with a fall or a strike from another limb. Horses with SDFT injuries often show pain, swelling and lameness 2-3 days following the injury. 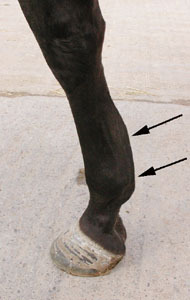 Lameness is commonly mild to moderate, transient or intermittent. Initial treatment goals for SDFT injuries in horses are aimed at reducing inflammation and limiting lesion expansion. Therapy should begin immediately and includes stall rest combined with no longer than 30 minutes of cold therapy (cold hosing, Game Ready, ice boots) applied several times a day, administration of nonsteroidal anti-inflammatory drugs (NSAIDs), and support bandaging to help reduce swelling. Once swelling subsides, gradual return to exercise can usually start, with a rehabilitation exercise program constructed by your veterinarian; each program is customized for each individual horse, and differ according to the extent and location of damage, use and current exercise level of the horse, affordability on behalf of the owner, and other factors may apply. Many exercise programs include the use of aqua therapy, complimented with various new regenerative therapies such as stem cell, plasma rich platelets, shockwave therapy, and therapeutic laser. Keep in stall until your veterinarian arrives to conduct a lameness exam. Increase work load gradually as opposed to abruptly. Depends on the location of the injury, severity of the injury, and the expected athletic career of the horse. Reinjury is common. Deep or inconsistent ground surface: SDFT loading is significantly affected by the ground surface horses are worked on. Deep, soft footing such as sand, puts horses more at risk of injury to the SDFT if they are usually worked on surfaces composed of different materials.